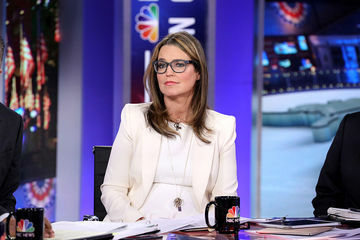 Savannah Guthrie showed amazing stamina while working through the presidential election. This results of this year's election drew on into the wee hours of the night—it's no secret that it left many Americans exhausted. But the people responsible for presenting the results, for calibrating votes, for discussing what each update meant had it worse than any of us did: They had to stay awake and articulate throughout, remain professional and composed, and run on too little sleep the following day to keep up with their jobs. Savannah Guthrie was one of those people on the front lines. She also happens to be eight months pregnant. Is Savannah's stamina commendable? Absolutely. Pregnancy is rough on your body. It renders you exhausted, swollen, hormonal and uncomfortable. But it is NOT something that should limit you, provided you're leading a healthy, stable, low-risk pregnancy, of course. Pregnant women go to work every day. So do non-pregnant people. Both facets run on not enough sleep, weather early mornings, put aside physical and emotional discomfort and get the job done. Savannah is one of these women, and we applaud her for that...but we also believe the stamina she displayed on Election Night proved an important point about pregnant women around the globe: They're still capable of putting in long hours, completing difficult tasks and just generally getting things done. Outlets like PEOPLE have come forward to celebrate Savannah for making it through the long night, and while we're with them—the woman deserves all the praise in the world for making working through pregnancy look effortless. But we can't help but ask: What other option did she have? We live in a world that expects pregnant women to work as hard as everyone else does or get left behind. And women all over do just that, every single day. Pregnancy is tough and tiring, but as long as you're healthy enough to keep up with your day-to-day life, you'll amaze yourself when you discover what you're really capable of accomplishing.